TheArmenianKitchen.com : Teach Children to Cook? You Bet! It’s never too early to spark a child’s interest in food - or food preparation, for that matter. I have to admit, as a child I never spent much time in the kitchen cooking with my parents or grandmother. In fact, I was usually shooed out of their way. I had a tendency to make a mess of things when it came to ingredients - and using a knife or other ‘grown-up" utensils was absolutely forbidden. How I ever became a Home Economics teacher with a focus in food preparation, I’ll never know! Actually, I do know. My sister, Dawn, suggested I teach Home Economics instead of the English or Social Studies I was leaning toward long before she became the very popular high school guidance counselor she is today. The fact is, I’ve always been interested in food - and eating, well, that came naturally. 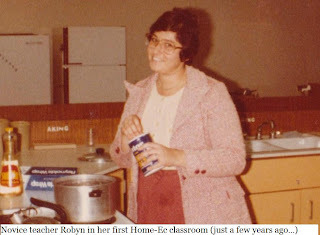 When I had my first teaching job interview in Red Bank, NJ, the school system’s superintendent sat me down, looked me in the eye, and asked why I thought I’d make a suitable Home Economics teacher. Without hesitation, I said, "because I like to eat!" As soon as those words poured out of my mouth, I thought, "Did I really say something that stupid in my job interview?" I slumped in the chair, and barely heard what the superintendent said next. I asked him to please repeat his statement. He said, "That’s the most honest, from-the-heart response I’ve ever heard. You’re hired; sign here." Having taught students the art (and science) of cooking for over 30 years, and seeing their enthusiasm and creativity peak when they prepared something they could actually eat, made every little near-disaster worthwhile. So, grown-ups, allow your children to attempt a new cooking skill, technique, or use kitchen tools -- with proper supervision, of course-- and watch their confidence and love for good food blossom. Hi Robyn! You were our student teacher in Fair Lawn HS Home Ec class - and despite that, you still wanted to teach! (Of course, our families had known each other for three generations.) I still remember...you taught us how to core a head of lettuce by smacking it on the counter-top. And you told us a story about moldy cheese (inspired by Drew!) FYI - last night's dinner was lule kebob, bulghur pilaf, fassoulia (meatless), and salad. Delicious! I clearly remember my student teaching days, and the lettuce core removal trick, but the moldy cheese story escapes me. I'm happy to see that you've become a terrific Armenian cook - inspired by your mother, no doubt. As I read your post Robyn I thought you were talking about me, at first. I'm so sorry now --- that I let them shoo me out of the kitchen. I never learned how to make all those wonderful dishes my mother and grandmother were masters of --- the boregs like none other, penarli, my mother's Harpoot kufta and yalanchi are still the best I ever had. However, they did teach my nephew how to make 'parag hatz' on a sahje --- and to this day we enjoy that hot bread with butter like none other. Anyone have a recipe for 'surum'? I have a recipe with the name "Surrum". It's a recipe for homemade pasta with yogurt (madzoon)sauce. Is this what you're searching for? If it is, I'll post it. Such a cute photo, Robyn.